Lake Cliffe Condos are arguably the best lodging in Dillon! Their premier location is immediately adjacent to the Dillon Marina, outdoor amphitheater, Dillon town centre, the bike path which interconnects with all of Summit County and of course, six premier ski areas! Any activity you want to enjoy is within minutes of Lake Cliffe, no matter what the season! We just remodeled our condo and now its even more comfortable, homey and modern! It's on the first floor, so you don’t have to lug your luggage, skis, groceries, etc up several flights of stairs. There is a ski closet outside the front door and parking is there as well. From the living room, dining room and deck you have views of Lake Dillon and Keystone Mountain. The deck extends into an open space area between 3 buildings that makes a U space and is filled with trees, so no one can look into the condo. The living room area includes a 40” flat screen TV, a DVD player, and WiFi internet (available all throughout the condo). There is a second TV in the twin bedroom. Please note: that the fireplace in the living room is inoperable. The fully-equipped kitchen includes a stove/oven, refrigerator, microwave, dishwasher, coffee maker, toaster and all the dishware and cookware you’ll need. You can enjoy your meal either in the adjoining dining room that looks out at Lake Dillon and the surrounding peaks or on the covered outside deck which includes a gas grill and lawn chairs. One bedroom has a king bed and its own bathroom. The other bedroom has twin beds (which can be put together to make a king) and its own bathroom with tub/shower. There is a pullout couch in the living room that makes into a queen, with a new memory foam mattress. There is a washer and dryer in the unit and a gas grill on the deck. I also supply all soap and paper products, and all linens. Enjoy yourself in the clubhouse, which is just steps away from the condo and features an indoor swimming pool, two hot tubs and changing room. Also available (by reservation) is a private meeting room. For winter activities Summit County is hard to beat! Enjoy skiing/boarding at one of the six world-class ski resorts (Keystone, Breckenridge, Copper Mountain, A-Basin, Loveland or Vail) all within minutes of our condo without paying the high prices at those resorts. There is also snowmobiling, snowshoeing, cross-country skiing, sledding and ice skating nearby. During the summer enjoy sailing, boating or kayaking on Lake Dillon, biking on the paved path or the numerous mountain bike trails, hiking, climbing breathtaking “14ers”, fly fishing, golfing, attending city-sponsored festivals, the Friday Farmers Market or the free Saturday night concerts at the amphitheater, or just sitting on our deck and watching the sunset over Lake Dillon! During the fall there is the magnificent display of golden aspen and other fall foliage to view. The town of Dillon and nearby areas contain all the basic amenities you need, plus numerous restaurants and brewpubs, a movie theater, bowling alley, and factory outlet shops. The free Summit Stage bus system (1/2 block away) can connect you anywhere in the county, including the ski resorts. 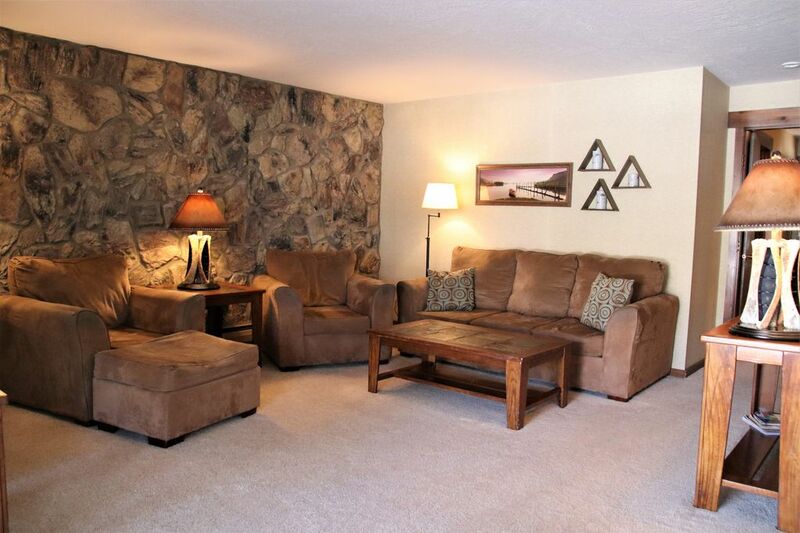 Come and enjoy all that Summit County and our condo have to offer!! I have lived in Colorado since 1976 and cannot imagine living anywhere else! I'm an outdoor person who enjoys hiking and fishing during the summer and downhill skiing and snowshoeing during the winter months. I also love to travel and explore new places. Because of my love of travel, I know what its like to stay at hotels and condos and I have organized and supplied my condo with all the amenities a traveler needs. I think you will find my condo your "home away from home." Enjoy an unobstructed view of Lake Dillon with Keystone Mountain in the background. An unobstructed view of Keystone Mountain / ski area. You can rent kayaks at the Frisco Marina which is at the other end of the lake about 10 minutes from the condo. You can rent bicycles just down the street from the condo. There is a bike path that is right by the condo where you can bike to Keystone, Breckenridge or Vail. There are 6 major ski areas within 30 minutes of the condo. The condo is on the first floor and there are no steps. There are 2 hot tubs in the clubhouse just steps away from the condo. Wonderful location and property owners! My wife and three boys stayed here for Spring Break (March 2019). The property is located in close proximity to anything and everything you could possibly want or need, including grocery stores, restaurants, ski resorts, etc. Paula, the owner and contact person, could not have been more helpful and great. She gave us some advice on where to go, what to do, and was always very responsive to any questions we had. The inside of the condo is a bit dated, but for the price and location, it didn't matter to us at all. I would definitely recommend this to anyone heading to Dillon! Thanks for your kind review. So glad you had a great time!! Yes you are correct about the living room furniture and it is being replaced right after ski season. Nice condo for our ski weekend. Paula is very quick to respond to emails and even leaves a City Market card. We discovered that the Summit County bus is the best option for getting to Keystone (as opposed to the parking nightmare there) and the stop is right across from the property. I'm so glad you enjoyed your ski weekend in Summit County!! Yes, the free Summit Stage bus system is incredible and one of the bus stops is just at the corner of my condo's complex. Sometimes the free parking at Keystone does fill up quickly, especially weekends. Hope to have you rent again soon. The condo was cozy and very conveniently located. We enjoyed being on the first floor. The condo was comfortable and well stocked with basic needs. The view is beautiful out the living room window. The extra ski closet kept our skis dry and safe. Paula was very helpful and answered our questions quickly. It was an excellent stay with great skiing. Thank you for your kind review! I am so glad the condo worked well for you. Hope to have you return again soon. Loved our time in the Lake Cliffe Condos. The location was great relative to Keystone for snow skiing. Found lots of interesting shopping is the surrounding towns of Silverthorne and Frisco. Discovered the most delicious bakery in Silverthorne called Panaderia La Escondida. Very clean accommodations and Paula was super efficient pertaining to arrival/check-out instructions and recommendations for local things to do. I highly recommend this property and look forward to renting again for next ski season. I'm so glad you enjoyed all that Summit County has to offer and the condo worked well for you. Looking forward to having you return again next year! Great location, literally just steps from the pool & hot tubs, cozy interior. Had a blast on our family mini vacation! Located in Lake Cliffe condos. Six major ski areas all within 1/2 hour drive and hundreds of trails for hiking, biking, and snowshoeing. Plus all the amenities of home...grocery stores, gas stations, shopping, restaurants and brew pubs.